If one were to guess where the current hotbed of choral singing is, South Korea may not immediately jump to mind, but make no mistake, it certainly is one of them. 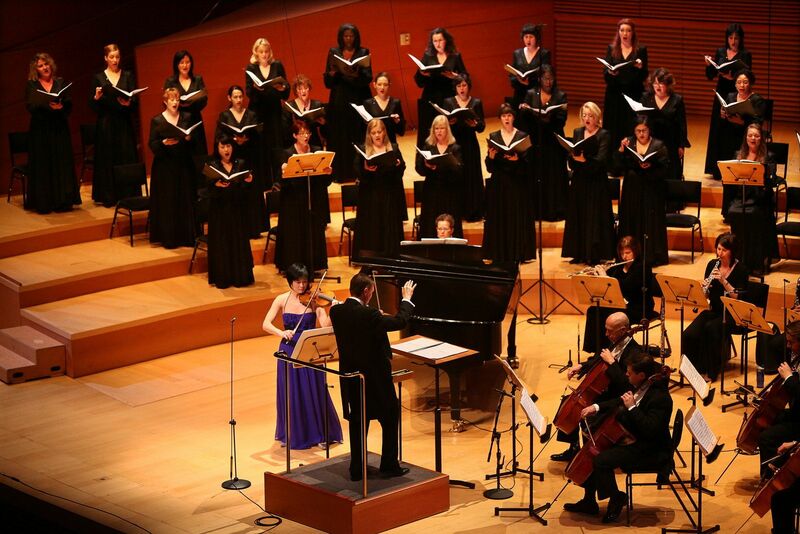 To illustrate this point, the Los Angeles Master Chorale, in the 10th anniversary season of its artistic director Grant Gershon, brought an ambitious program of Korean music and a world premiere to Disney Hall Sunday Night. With the aroma of Korean Barbeque still lingering (the Chorale arranged for a truck to be parked outside of the concert hall for several hours), the first half of the program began, featuring songs by native Korean composers, all sung in Korean. This was certainly a daunting task for a primarily English-speaking group, not just from a language standpoint, but also from a style standpoint. Not to fear. The Chorale was masterful in implementing elements of Korean vocal style, including improvisation, mournful portamento, and a noticeably brighter sound, in its singing, thanks in large part to its consultant and brilliant soprano soloist Sunjoo Yeo. The most daunting piece of the first half was Hyowon Woo’s Me-Na-Ri, a work for triple chorus, soprano and percussion, which was choreographed, complete with stunning lighting effects. Two of the three choirs began on opposite sides of the orchestra section audience, making a triangular formation with the onstage choir before processing to the stage. Based on the Arirang tradition (a folk song whose longed for subject is unclear), the occasionally rhythmic and angry, but ultimately poignant song, showcased the chorale’s stylistic chops with sustained periods of improvisation and guttural sounds. The song died off with a murmur as the hall lights faded to black. Another highlight from the first half was Heejo Kim’s arrangement of Gyeongbokgung Taryeong, a folk song in a rollicking tempo that tells of the reconstruction of a grand palace. The Chorale sang with a clear connection to the text and optimistic spirit of the piece. The substantial Korean contingent in the audience let out a boisterous ovation before the final notes ended and it was clear that a beautiful and authentic connection had been made between audience and performers. The first half was rounded out with four other songs by notable Korean composers, two of whom were in the audience, including Hojun Lee, whose achingly beautiful Arirang Fantasie ended the half. The main event for the evening was the world premiere of Mark Grey’s Mugunghwa: Rose of Sharon. This work for mixed chorus, soloists, chamber orchestra and solo violin is based on a series of poems by Namsoo Kim, a Korean prisoner of war and refugee who spent much of his life trying to reconnect with his family left behind in the North. English translations of Kim’s poems are interspersed with three letters from his sister, sung in Korean, creating a libretto of sorrow, loss, longing, and eventual hope. Grey’s composition is impressive in its lack of self-awareness. With poems so descriptively dark, it would be easy for a composer to go to the extremes of compositional techniques and stay there, but by only occasionally doing so, Grey creates balanced textures and arcs that stay away from over-the-top expression. Grey’s music is most effective in his understated settings of the “Sister’s Letters,” which were highlighted by beautiful solos sung by Claire Fedoruk and Adriana Manfredi. Grey’s settings of Kim’s poems are often rhythmic and non-linear with voice sections creating a texture by focusing on a key word, at odds with the adjacent section. The piece’s harmonic language is tonal, but not predictable with some much needed moments of fury and dissonance, often provided by the solo instruments in the orchestra. This brings us to the violin solo. To call it such really understates its part in this piece, as the instrument is incredibly busy with concerto-quality lines for over a half hour. Violinist Jennifer Koh, whose personal interest in the music’s subject matter brought her to the piece, played intensely and masterfully. Her tone was edgy and frustrated when necessary, but always beautiful and pleasant. Her virtuosity was stunning. If there is to be a future for Grey’s composition, which one hopes there would be, the authority of Gershon’s preparation and the Chorale’s execution would no doubt contribute to it. They sang with an honest, pure sound and a mastery that belied the piece’s age. Indeed, the entire concert was such, and, given the difficulty, made this groundbreaking program one Maestro Gershon, and all involved should be exceedingly proud of accomplishing.